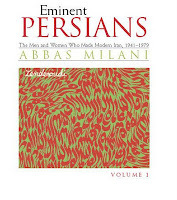 Over the last few days, whenever I have had a moment to myself in the midst of all the festive mayhem, I have been reading Abbas Milani's Eminent Persians. As it says on the back cover of the book, Eminent Persians provides a panoramic narrative of what made modern Iran through the lens of individual lives, between 1941 and the Islamic revolution in 1979. I have always been interested in reading biographies and been fascinated to learn why people become who they are and how the environment and the era shapes their way of thinking. Eminent Persians is like a fun way of reading tens of biographies in one book within the context of what happened between 1941 and 1979 in Iran. Its not the first book by Abbas Milani I have read, Persian Sphinx was the first book which I got to know him by, and what I like most about Mialni's books, is that through painstaking research and candid examination backed by documented evidence, Milani doesn't just collate the myths as the definite history, he is in fact a myth buster. No mean task in a culture that revels in the cult of martyrs and the political factions which measure their success by offering "untouchable" heroic icons and number of martyrs they have offered to the struggle. There is no need to read the book from the beginning to the end, each chapter is a short condensed biography of an Eminent Iranian who in various ways helped shape Iran's modern identity and can be read at one's own choice and preference, but what makes reading the book an absolute delight is the honest revelations of the hidden facts and withheld information that the followers of each iconic figure have either been desperately trying to cover up or dared not to investigate. There is also plenty of good quality research into myths, which were cultivated against or for the public figures at the time, in order to promote various political agendas in Iran. Each time you come across one of these moments of discovery, an involuntarily shaking of the head, expressing disbelief, or an uttering of 'Oh My God!' in one's head, marks the moment. The first two chapters I read were about the industrialist Khayami brothers and another successful businessman at the time, Hojabr Yazdani. My interest in the Khayami brothers, successful businessman who had become rich not from inheriting land but by their industrious entrepreneurship, was their philanthropy activities, a rare trait amongst rich Iranians, and my reason to read the chapter on Hojabr Yazdani next was because I had heard my father curse him so often as the 'pathetic gangster and a crony of the Shah's regime'. Hojabr Yazdani started in sheep farming and eventually controlled much of Iran's banking. The things I heard about him, personified him as one of the gangster types in Al-Pacino's Scarface movie, because of his armed bodyguards who accompanied him everywhere and his ostentatious taste in wearing jewellery. The hearsay amongst the public reputed him as the symbol of cronyism and corrupt excesses of that era. Reading about the Khayami brothers and Hojabr Yazdani, it was interesting to find out that both had offered their help to the Shah to save his throne from the 1979 revolution. Contrary to my previous perception that all of the Shah's supporters and his elite had quickly packed their bags and fled as soon as the going had got tough, there were others who could have fled but were willing to stay behind and dig their trenches to save the Shah's rule. It was the man they were loyal to, however, who had no stomach to carry on the fight. The chapter I really want people who are interested in Iran's current affairs and what led to the present situation in Iran to read; is the one on Ali Shariati. He is the man who I always blame for mixing up the minds of the Iranian youth with his version of political Islam. 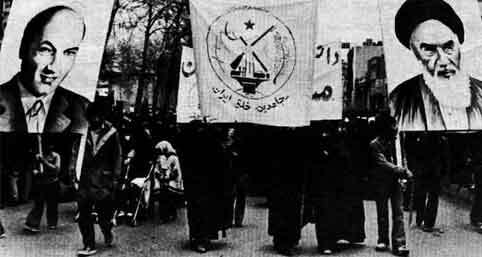 Shariati created an intellectually appealing shopfront for political Islam which pushed so many of Iran's youth towards a dangerous cocktail of Islam and Marxism. If someone asks me who do I blame most for what happened in Iran in 1979? The one person I would name without hesitation, would be Ali Shariati. I remember many of my friends and contemporaries falling for his nonsense after reading his books and how I was the lone voice in saying the guy was a fraud hell bent against our national interests. The hero of Shariati's writings was an Arab bedouin and one of the first converts to Islam, Abu-Dhar Ghaffari, whom Shariati venerated in his writings as the first Islamic Socialist! Reading about Shariati in Abbas Milani's book, I found out a lot more about him that I didn't know. How Shariati got his scholarship to study in France for a Doctor d'universite, not on the same par as a PHD according to Milani, was one of those myth busting moments I was talking about earlier, where one shakes his head in disbelief. Shariati, a mediocre student himself, made sure that all other students in the class were downgraded in their exams, including the top student in the class, so that he got the top marks himself. Thus Shariati ensured the state scholarship was awarded to him and his wife and newborn baby who accompanied him to France. I remember years ago, reading one of his letters to his son, where he was saying if his son was a student in his class, he would treat him just like any other student with no special privilege, yet he got his own scholarship in the most unscrupulous way by denying others who deserved it more. What a hypocrite! Shariati's subject of study was the Persian text of an old manuscript, the Virtues of Balkh. Did the country really need to set up a scholarship to send someone accompanied by his wife and new born baby to study Virtues of Balkh in France? Was this manuscript the most pressing issue in the country's development? What was the state thinking of? And like many of the Iranian students on government scholarships who went to the West at the time, they came back as radical Marxists or Islamists with the overthrow of the regime, which had provided them with the scholarships, as their main objective in life. The next revealing moment in the chapter on Shariati, is how the Shah's secret police, SAVAK had insisted the Tehran university to give him a job but because he failed the requisite test that was given to all applicants, SAVAK then successfully convinced the Mashad university to hire Shariati as the assistant professor of history. Even his famous lectures at the Hosseiniye Ershad, where he delivered sermons that combined Lenin's theories of avant-garde intellectual leadership with Shiism cult of martyrdom, were at first viewed and approved by SAVAK as a way of diverting the youth away from Communist ideas which were growing in popularity at the time. It took SAVAK a 'long time to realise, Shariati was taking them for a ride', Milani writes in his book. Finally Shariati's death at Southampton, England, according to all the medical records was due to coronary heart failure and nothing to do with SAVAK having poisoned the man who advocated martyrdom to become another martyr himself, as the myths surrounding his death claimed. There are interesting and thought provoking myth busters in the other chapters too. Mossadegh's opposition to Reza Shah for the construction of the national railway system, for example, or the role of Tudeh Party hero, Khosrow Roozbeh in the murder of the journalist Mohammad Masoud and even in the murder of his own comrades, and how someone like Khalil Maleki, a fearless pragmatist without the radicals' pretence of purity was ignored by his contemporaries. 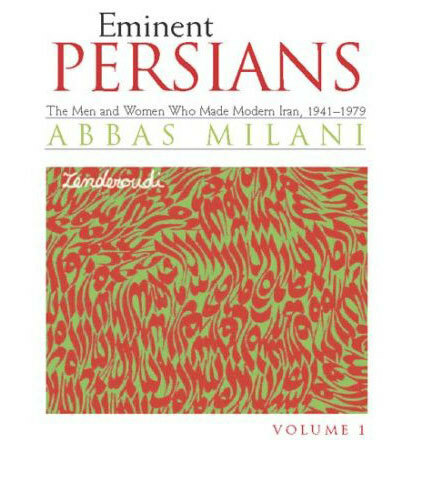 If you are interested in Iran's contemporary history, I definitely recommend you read Milani's Eminent Persians. Have you become Karoubi and Mousavi Supporter?? I really hope this is not true...Why someone as savvy and intelligent as you would believe in the reformist garbage? One of the things I absolutely find stupid is Milani (and other gharbzadé Iranians) insisting on the Greek origin term "Persian". (Note Persian is the Greek word for Pars or Parsi that has entered the English language. Iran is made up of many ethnicities in addition to the Pars (or Fars) people, such as Azari Turks, Kurds, Baluchi, Armenians, Arabs, and many more. It is estimated that 23% of Irsnu answer speak Azari Turkish. I am an Azari and very proud Iranian. I object to the linguistic marginalizion of everyone who isn't fars by the Greek term Persian. Under the UN recognition there is no Persia. It is Iran and we are ALL Iranian. All ethnicities. Esp non - proud Western pandering Iranians love using colonialist language hoping to please Westerners calling themselves Persian. Pathetic.